tried something. just a lil snack. you will have to eat about 300 to get full. but you might get fed up of crunching before you reach 100.
lime juice, onion, all purpose, black pepper, paprika, garlic powder, ginger powder, italian seasoning. i also used some of the crusting mixes that ms mar-fan kindly supplied to me. i use it like a seasoning sometimes because it has a nice french onion kinda flavour. i left it to marinate, then cooked it in a deep frying pan. after it browned up and sprung all its juices, i added some olives and a mixture of ketchup and some left over salsa i had (a regular saucy salsa with chunks of tomatoes, peppers, onions etc.) cooked it down with a little touch of cooking butter. just a tip. i had some wanton skins, so i cut them in half and fried them up to make some triangular chips. tortilla inspired. this was the end result. it was nice. a little too salty i think because of the all purpose. i added some more after putting the sauce in because it looked a bit watery. but i misjudged. however, i thought you all might have been interested in the concept. started out by putting some minced beef into the trusty slow cooker. tossed in some roughly chopped onions and sprinkled black pepper, garlic powder, paprika and just a little salt into it. i also crushed and sprinkled 1 beef and 1 vegetable maggie cube into it. i let that cook for about half hour. it basically seasoned right in there. next i added the chipotle marinade. (you will notice by now, i didn't use any of the seasonings the way they were intended to be used. that's no fun anyway.) i followed the directions, but not the measurements. the pack of powder, some water and some olive oil. mixed it up and poured that into the beef. i let that cook for about 15 more minutes. by this time of course the place is fragrant and i am sitting still so that the neighbors don't figure out that i'm cooking and come beggin for a plate. next i added some white rice. mixed it up so everything was evenly distributed. force of habit, i put a little piece of cooking butter in. can't help myself. but i don't think this dish really needed any more oil. no probs. is not health food. added some coconut milk powder to the mix, then a tin of green peas. covered and let it cook until the rice was cooked and the water boiled out. took about another 30 to 40 minutes. 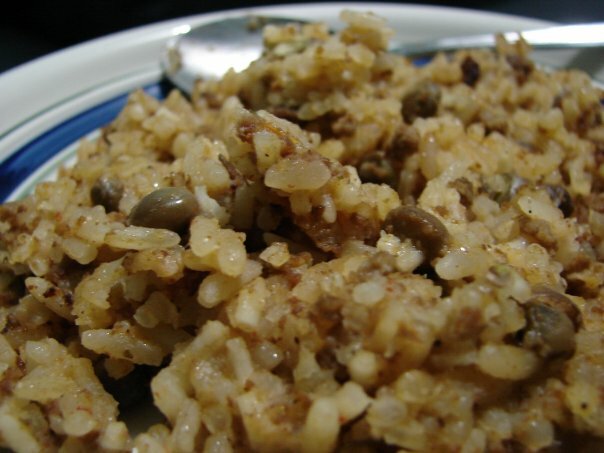 the end result was a cross between a pelau and a jambalaya rice. the heat from the chipotle gave it a spicy kick, while the coconut milk made it nice and rich. knock yourself out with it just so, or treat it like a pelau with a lil cole slaw on the side. and thus were my activities in the off times. things should clear up soon and i'll be blogging again. until such times, leh we bubble.